Senior lecturer and alumna Ngarino Ellis (LLB, 1993; MA, 1997; PhD, 2012) is in a unique position to transform global art history. 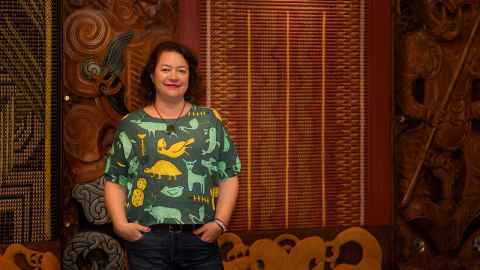 “The really gratifying thing is that people who write about Māori carving don’t usually look like me, they don’t wear red lipstick; it’s a beautiful thing,” says Ngāpuhi and Ngāti Porou art historian Dr Ngarino Ellis. We’re talking about her warm reception on the East Cape, where last year she had a special launch of her award-winning book, A Whakapapa of Tradition: One Hundred Years of Ngāti Porou Carving 1830-1930. Referred to by Ngarino as “a 17-year PhD”, the handsome book won the 2017 Ockham Judith Binney Award for Best First Book, Illustrated Non-Fiction, as well as the Te Mahi Toi/Māori Arts Award at the 2017 Ngā Kupu Ora, Celebrating Māori Books and Journalism, and the inaugural Best First Book award from the NZ Historical Association. “It was five years in production and I’m so pleased it got the critical acclaim; it was great to have that validation,” she says. Even better, Ngāti Porou, whose rich tradition it documents, is delighted with it. A senior lecturer in art history in the University’s Faculty of Arts, Ngarino focuses in her research on Māori art history, particularly Māori art and culture from c800 to the present day, and including both marae and gallerybased art practices. She has concentrated on pre-1900 art, especially tribal carving, moko signatures, personal adornment and identity, with an emphasis on Māoricentred methodologies. Ngarino is currently the only Māori art historian employed at tertiary level in New Zealand. There used to be others, but they’ve since left the field; although being on her own has meant she’s fostered fruitful collaborations with colleagues in other disciplines like fine arts, architecture and history. One of the main problems is the feeder system into the subject from high schools, and the general ‘devaluing’ of the arts in schools and universities, she believes. One of her specialist areas, always intriguing for the media, is art crime. She is a founding trustee of the Art Crime Research Trust, whose main aim is to hold annual symposia in the field in Wellington. This semester, one of her favourite courses is called The Art of Gender Politics. In her role as the University’s Convenor of Museums and Cultural Heritage, which she held from 2012 to 2017, she examined different approaches to the world of museums theory and practice. Last year, the programme had 21 students, including the first cohort of Master of Heritage Conservation students. The numbers have tripled since she started in the area. Thinking back, a life combining her commitment to her people and her interest in art seems inevitable, but it almost didn’t happen. She grew up immersed in the Auckland art world, “there were exhibition openings to attend every week”, but also had a unique chance to experience life in the northern hemisphere. “Every five years, our family (my father, me, my mother and twin sister Hana) went back to my father’s home in the UK, when he had a sabbatical. “We went to a little village called Kingsthorpe in Northampton, where our Granny and Pappy lived; I’m very familiar with all of Northampton and very close to my whānau there.” She left school – Westlake Girls, where her own daughters now attend – at the end of sixth form. She completed her conjoint degree, got admitted to the Bar, practised a little, but wasn’t really enjoying it. Māori approaches to art history prioritise the personal, the role of the artist, and their relationship with their community. A key mentor, Māori feminist academic Emeritus Professor Ngahuia Te Awekotuku (University of Waikato), offered her a tutoring position in Art History at Auckland and she found herself at a crossroads. So things have turned out pretty well. Her husband and their three children have been able to travel with her on her own sabbaticals, and enjoyed the experience. The University of Auckland has been a hub for her family across a couple of generations. However, she feels there still isn’t enough support for Māori and Pacific academics. Her most ambitious project to date, “which has to be with Auckland University Press by the end of the year”, is Toi Te Mana: A History of Indigenous Art from Aotearoa New Zealand, a Marsden-funded book she’s been working on with the late Professor Jonathan Mane- Wheoki (CNZM) and Professor Deidre Brown from Creative Arts and Industries. Internationally, she says, art historians have begun to dismantle boundaries around Western European fine art that have “purposefully excluded indigenous making and makers,” and this coincides with a time when Māori are leading research into indigenous knowledge. magazine for alumni and friends of the University of Auckland.